Our community has a pretty good handle on embracing naturally curly hair. We know all too well the denigrating buzzwords that the mainstream media throws around when describing our hair and the ways in which companies are always trying to "tame" us. The natural hair movement has made giant strides, and the industry and media are starting to get on board. But in some ways I feel we haven't quite caught up when it comes to embracing naturally graying hair. Gray hair is still widely looked down upon as something to avoid, something to cover up, and something to fight off for as long as possible. 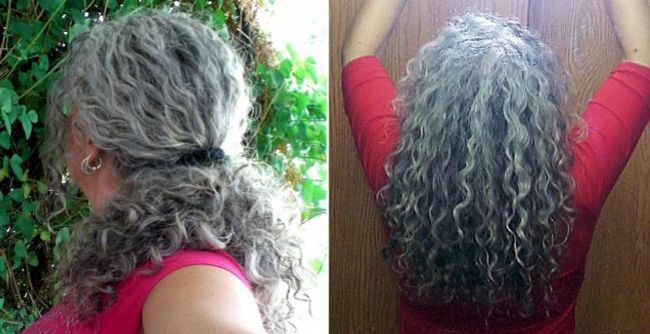 I think gray hair is beautiful, natural, and does not make you invisible, and NaturallyCurly community member Jeepcurlygurl is proof! Her curls and positivity have been inspiring our CurlTalk forum community for years, and I think she put it best when she said "if people are happy dyeing their hair, that's great! But if you want to let your gray hair grow out, do it!" Here's how she did it. When did you start going gray, and why did you decide to embrace your grays from the beginning? I come from a family with some beautiful gray hair. My maternal grandmother had dark hair with a gorgeous white streak in the front, my mother had thick wavy salt and pepper hair, and my dad, in his 80's, still has a good head of white hair. I wanted my hair to stay healthy. I didn't want to waste the time and money dyeing my hair. What was the transition process to gray like? It wasn't easy, there's no denying it. The change is drastic and more difficult for those of us with dark hair, but I doubt it's easy for anyone. At first I didn't like the color, I felt invisible, washed out. But as it came in I learned to love it. When I started to go gray I cut my hair into a chin length curly bob and kept trimming it up as the gray grew in. Once the gray reached the ends, I let it grow and now have mid back length salt and pepper hair with some solid streaks of gray/white. It was so worth the year of having the 'skunk stripe'. Hey, skunks are cute! Can you tell us about how your hair has changed? Some of the grays are wiry, some are straighter (3A instead of my usual 3B), sometimes it feels a bit dryer, but all in all it is still pretty much the same. I have never gotten more compliments on my hair in my life! 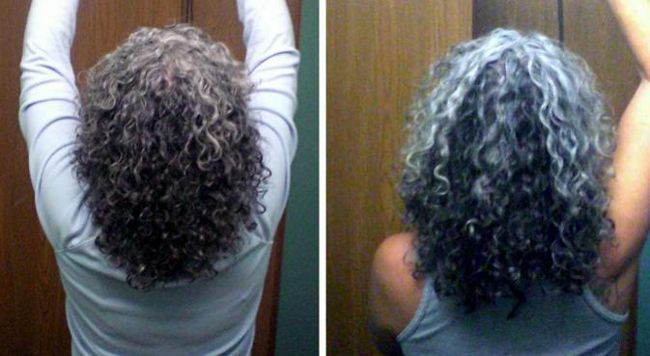 How has your routine changed since going gray? My routine is nearly the same. The only thing I've added is occasionally using coconut oil on my hair overnight. It is a nice conditioning treatment and also helps with detangling. 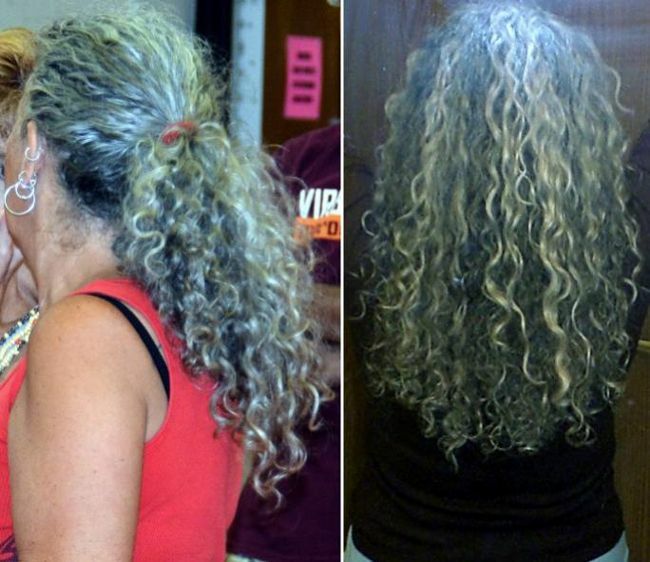 What have been your biggest challenges in caring for gray hair, and how have you dealt with them? I spend time in the sun and wind, at the beach, on motorcycles and boats, etc, so my hair does tend to get yellow. I buy red/gold corrector and add some to a bottle of conditioner and use this as a co-wash once a week or so to help negate the yellow. But even if it's a bit yellow I don't fuss about it too much. What are your favorite products? Do you follow the CG Method? I have been following the CG method for about 12 years. But even before that, back in my teens, my mother told me to quit using shampoo every day as it would dry out and damage my hair. That was 40+ years ago so she was kind of ahead of the times! I still used shampoo (the original Herbal Essence Shampoo was my favorite. Oh that scent.) but not every day. I like a simple routine, with inexpensive, easy to find products. My long time favorites are Suave Coconut Conditioner, VO5 Kiwi Lime conditioner, LA Looks Sport Gel. I also do vinegar rinses, honey rinses, deep treatments with oils mixed with conditioner. Gray hair doesn't make you old. Being old makes you old. How do you achieve your curl definition? I co-wash, rinse, add gel to very wet hair, plop in a turban towel for 15-20 minutes, scrunch, air dry for 15-20 minutes or so and then use a pancake diffuser for a few minutes with my hair over my head, scrunch, and done! 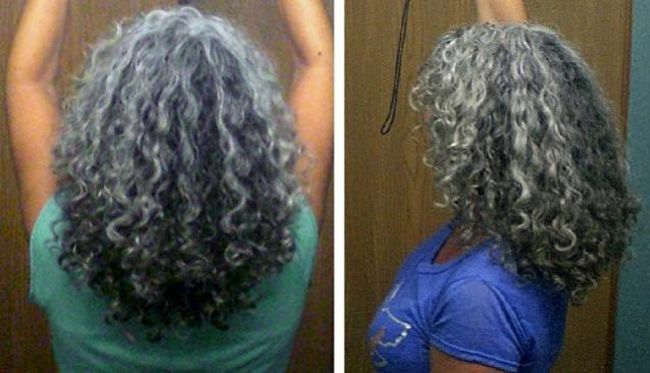 How do you feel about the way gray hair is portrayed in the media? I think the media does a terrible disservice to people by convincing them that youth is everything, that we become invisible and unimportant as we age, that we need to spend hours of our time and tons of money to make ourselves look young. Gray hair, wrinkles, sags and bags,anything age related is looked upon and portrayed in such a negative manner. Aging is a natural process and we should accept it as such. You don't have to be young to be youthful. I will be 60 in a few months and I don't consider myself old in the least. Gray hair doesn't make you old. Being old makes you old. And there's no stopping it. If people are happy dyeing their hair, that's great! But if you want to let your gray hair grow out, do it! Don't let family, friends, partners, or the media convince you to do otherwise. Take care of yourself, live your life, and stop worrying about aging. Get a new hair style, cut it short, grow it long, buy a new lipstick, buy some new clothes in bold colors, stay healthy, stay active, work your brain, do things that make you happy. And one more bonus to having healthy, happy, curly, gray hair - I have never gotten more compliments on my hair in my life! I get compliments from young people, old people, women, men, girls, boys. Not a bad thing at all. 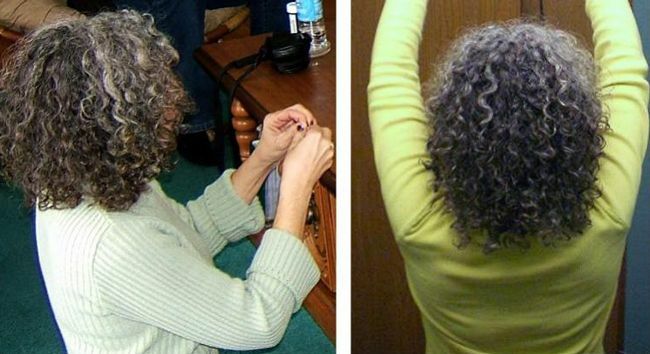 Have YOU started (or are you considering) embracing your grays? How do you manage your grays?